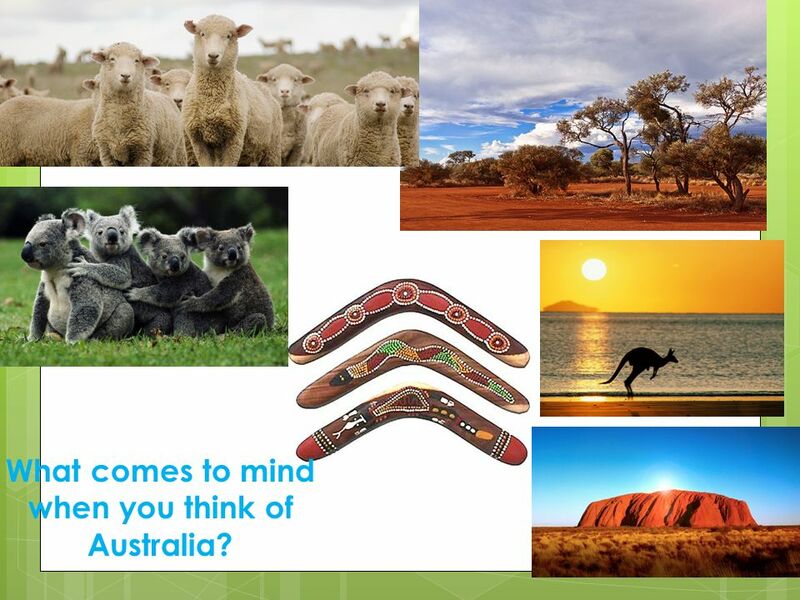 2 What comes to mind when you think of Australia? 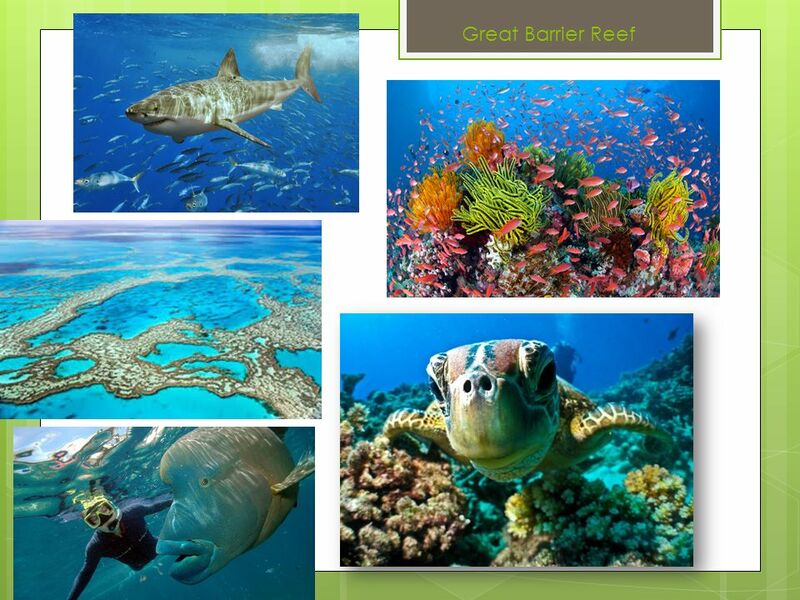 The Great Barrier Reef is the world’s largest coral reef. Coral reefs are made up of living organisms. They exist in the ocean. It is so vast that it can be seen from outer space. 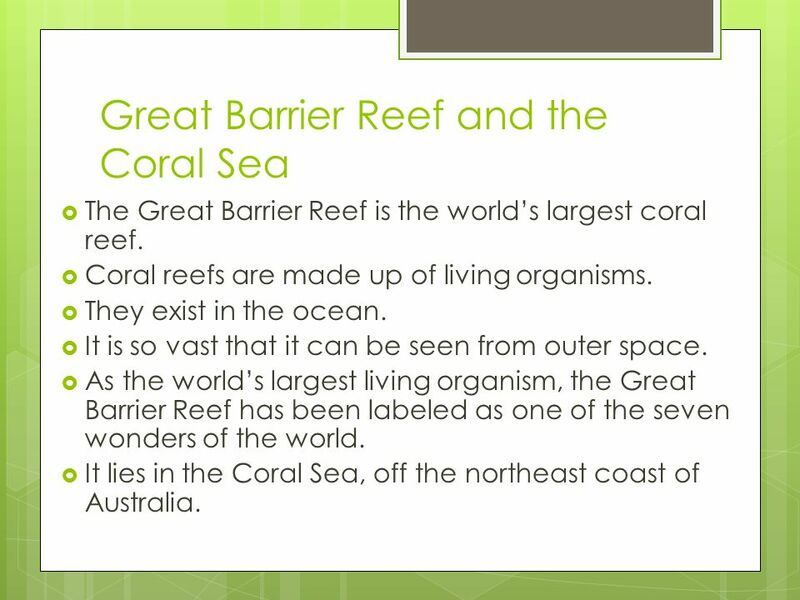 As the world’s largest living organism, the Great Barrier Reef has been labeled as one of the seven wonders of the world. It lies in the Coral Sea, off the northeast coast of Australia. 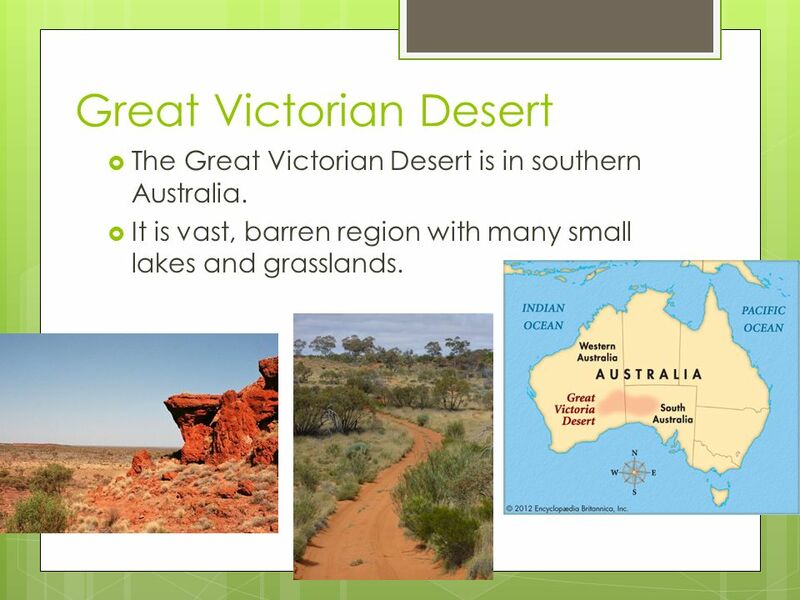 The Great Victorian Desert is in southern Australia. It is vast, barren region with many small lakes and grasslands. 10 Ayers Rock Ayers Rock is a giant sandstone rock formation. It lies in central Australia. Ayers Rock has many waterholes, caves, and springs. 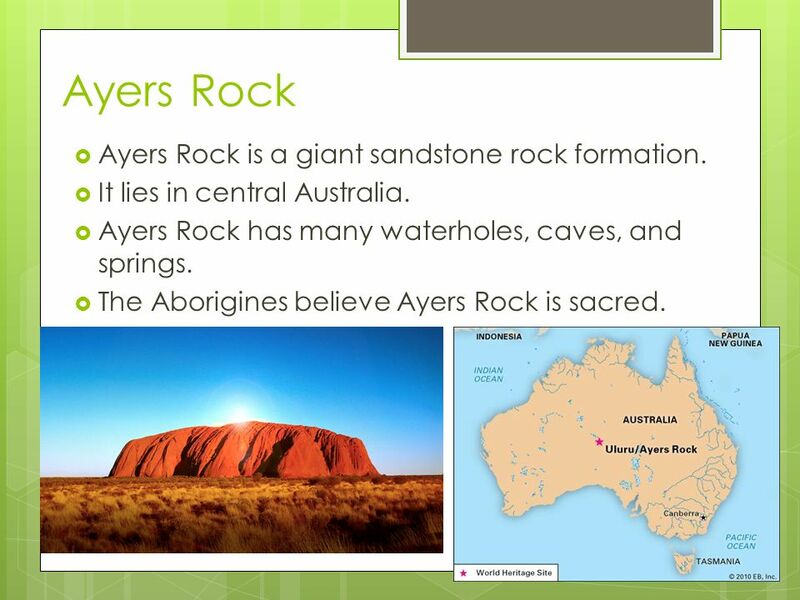 The Aborigines believe Ayers Rock is sacred. 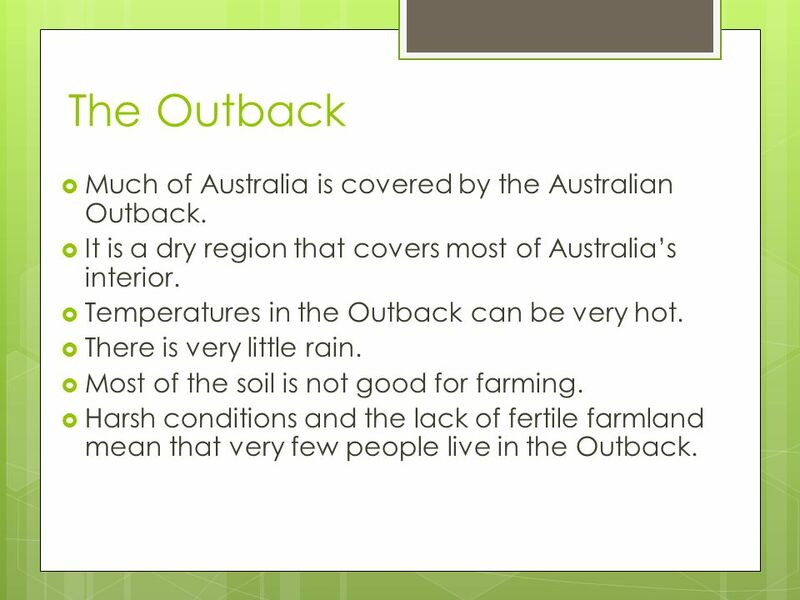 11 The Outback Much of Australia is covered by the Australian Outback. It is a dry region that covers most of Australia’s interior. Temperatures in the Outback can be very hot. There is very little rain. Most of the soil is not good for farming. Harsh conditions and the lack of fertile farmland mean that very few people live in the Outback. 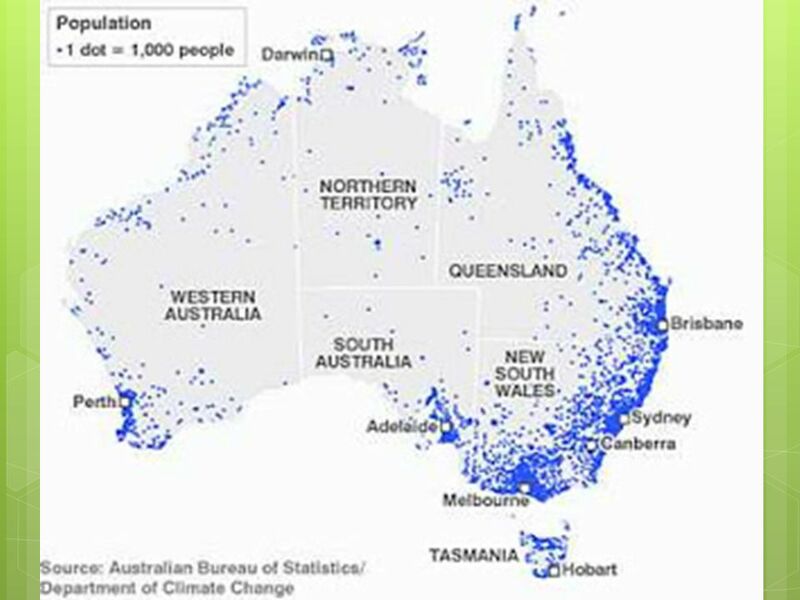 14 Population Most Australians live in cities along Australia’s southeast coast. This is largely because of the mild, temperate climate the region offers. Due to rich mineral deposits, portions of northwest Australia are home to mining communities. Miners rely on these natural resources for income. 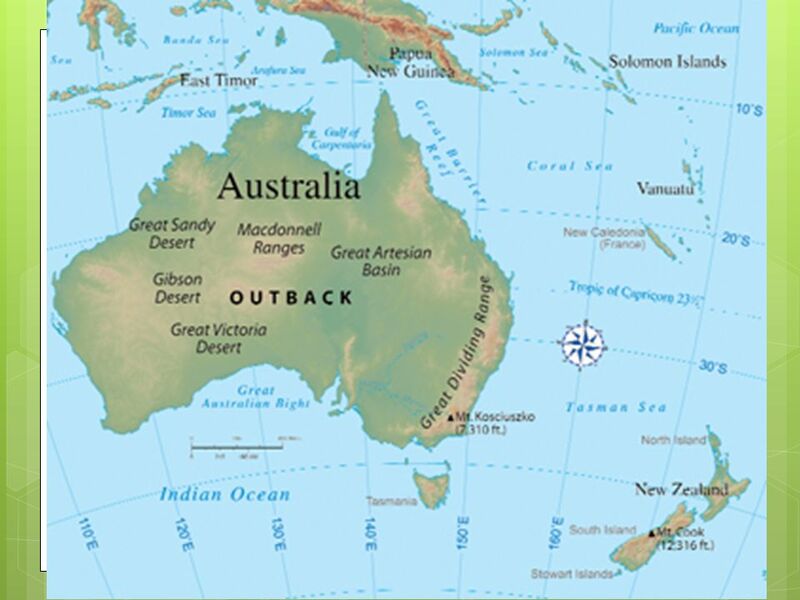 The interior of the continent is dominated by the Outback. 15 Trade and Resources Australia’s geography impacts trade. Because of its dry terrain and vast wilderness areas Australia has historically had to import many of the agricultural products that it needs. International trade has long been a critical part of Australia’s survival. Australia’s largest trading partner is China. 16 Australia's Culture Australia’s culture is very much like that of Western Europe or the United States. 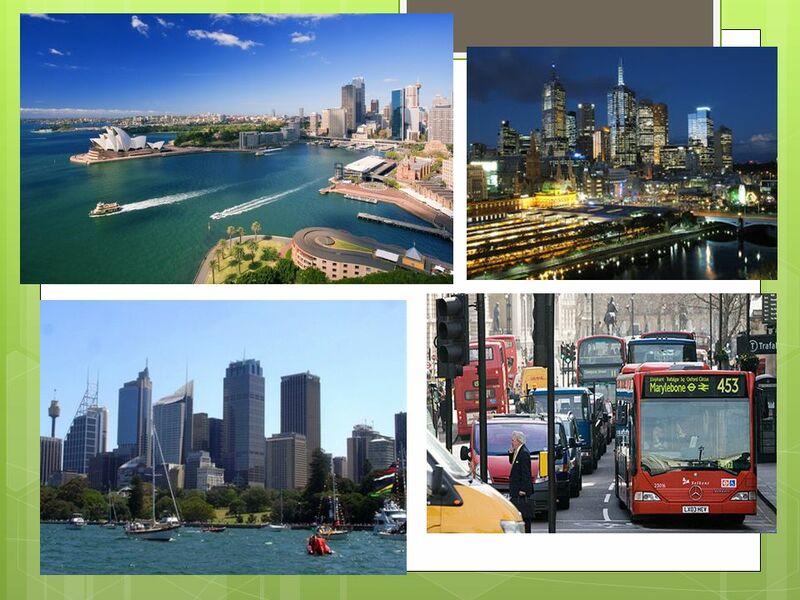 Many of the fashions, products, musical styles, movies, businesses, and leisure activities that exist throughout the western world can be found in Australia. 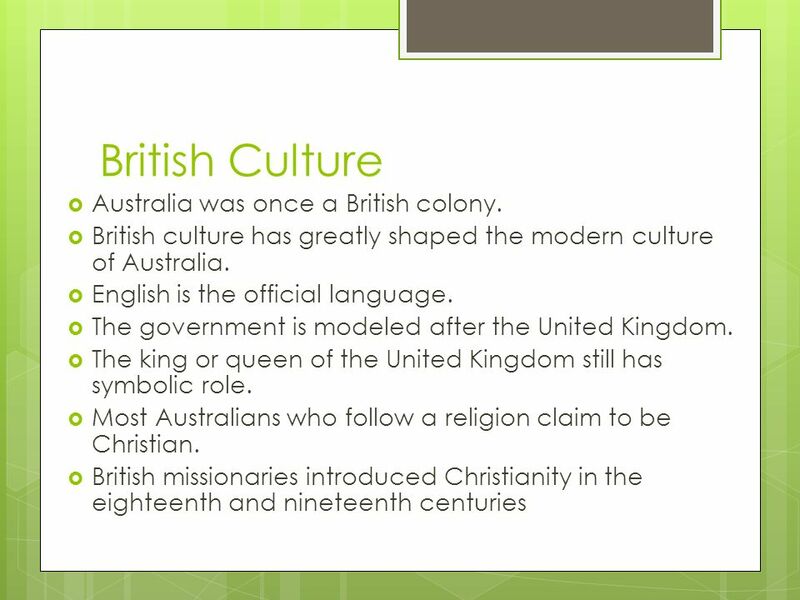 17 British Culture Australia was once a British colony. 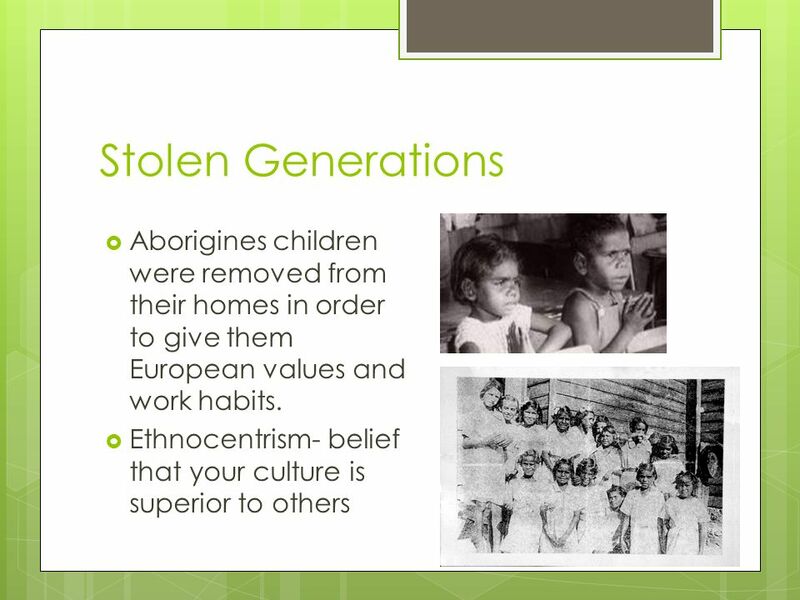 18 Aboriginal History Aborigines are native Australians whose ancestors lived on the continent before Europeans arrived. When James Cook arrived he was told not to claim the land unless the natives agreed- they didn’t but claimed land anyway. Genocide or mass murder of Aborigines who were considered savages by the Europeans. 20 Aboriginal Culture Aboriginal cultures still exist in Australia. Many Aboriginal citizens have adopted western customs (fashion, work in urban areas, go to universities, and have similar lifestyles) Other Aborigines live a more traditional existence. Many of the societies exist in the Outback, where the harsh climate and geography discourages Europeans from interfering with the native peoples’ way of life. 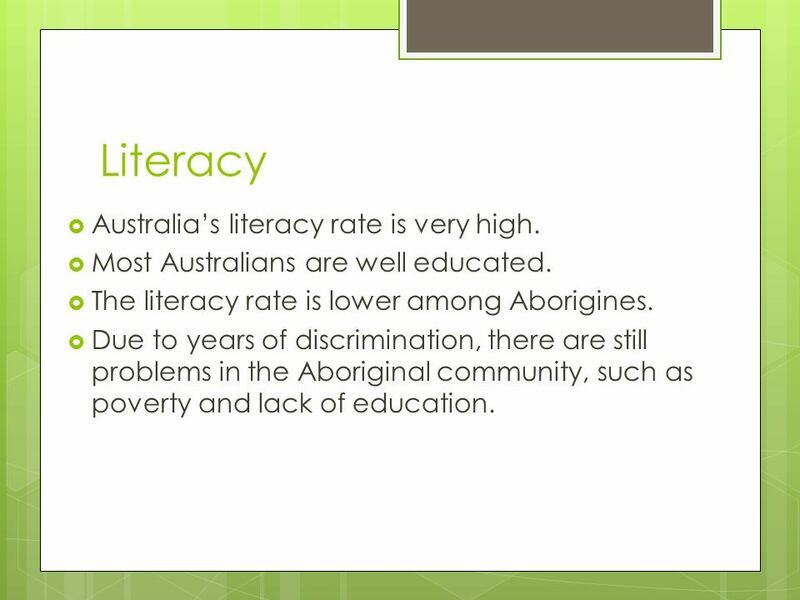 21 Literacy Australia’s literacy rate is very high. Most Australians are well educated. The literacy rate is lower among Aborigines. Due to years of discrimination, there are still problems in the Aboriginal community, such as poverty and lack of education. 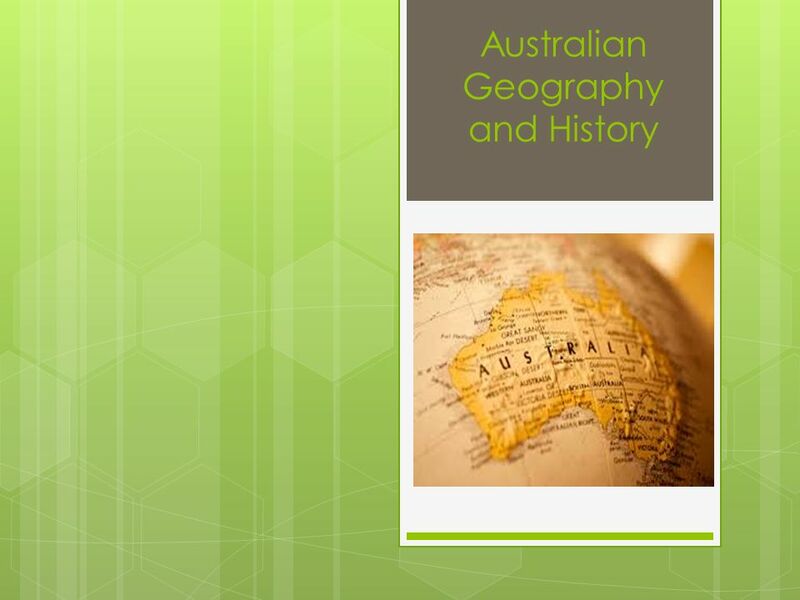 Download ppt "Australian Geography and History"
Australia The Land Down Under. AUSTRALIA THE LAND DOWN UNDER. THE AUSTRALIAN FLAG. Instructions Use the slides in this presentation to locate, label, and describe the physical features of Australia. Be sure to create a symbol for each. Australia an introduction Prof.ssa Simonetta Gatto Istituto Comprensivo di Casella. Australia. © Lenka Lexová Introduction  the official name is the Commonwealth of Australia  it's a country in the Southern Hemisphere including the. 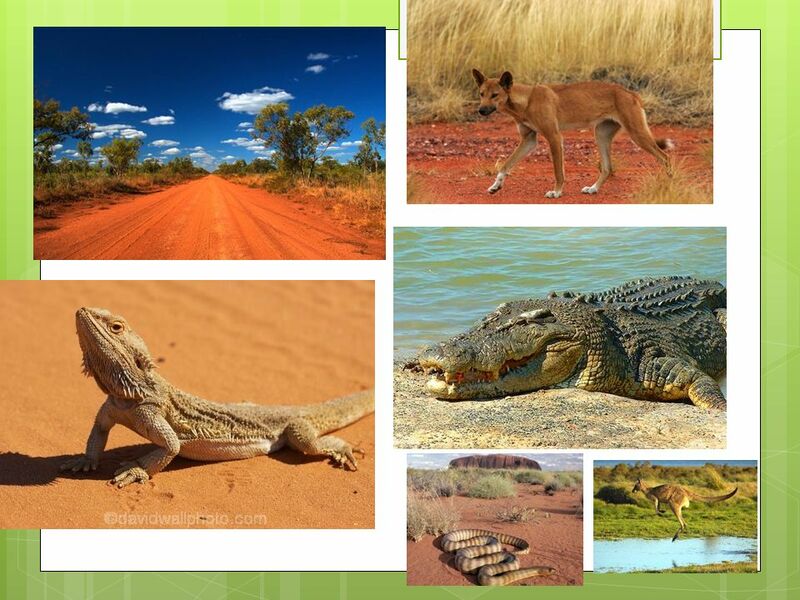 What is the first image you think about when you think about Australia? Why do you think that is? AUSTRALIA “THE LAND DOWN UNDER”. 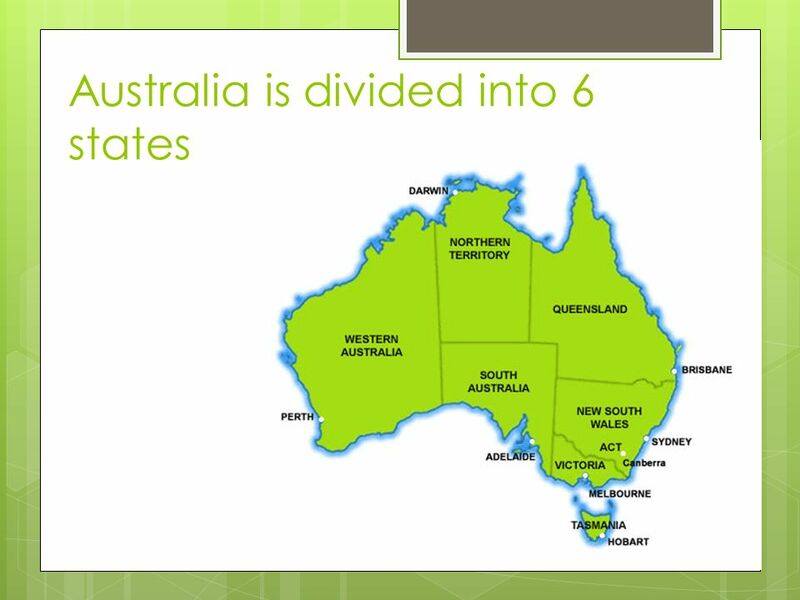 Geography of Australia The Shaping of a Continent Grade 7.